Waves – Chesapeake Chapter U.S.L.H.S. “High tides and wind-whipped waves hurled rocks through Point Wilson Lighthouse’s [Washington] north door over the weekend, flooding the beloved landmark’s ground floor.” Reported on December 14, 2004 by Nick Koveshnikov. 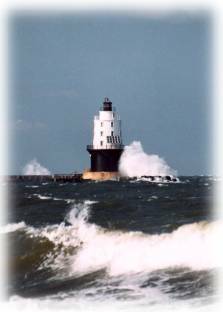 Many lighthouses are vulnerable to wave action due to storms. In the winter months, winds and waves create “reefing ice” where blocks of ice several feet thick are piled one on top of another. 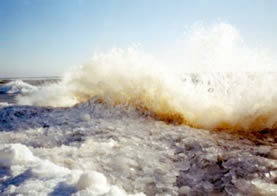 This type of damage occurs especially in the Great Lakes region. Even lighthouses that sit high upon bluffs overlooking the sea are not safe from nature’s fury. Not all wave threats come from ice flows or storms. Rising sea waters continuously reshape land formations. The tides carry away and redistribute the beach. This coastal erosion is referred to as shoreline retreat. This type of erosion prompted the move of Cape Hatteras Lighthouse. No matter where you are on the coast, the wild waves can put on quite a show. Some of the best waves come just after a windstorm and from offshore storms. Stormy seas can be dangerous and are best viewed from a safe distance and higher locations.